My mother, my brother, and I all left home when we were sixteen-years-old. The one thing we all had in common? The same woman – my mother’s mom− raised us all. Because I wasn't around when my mother was a teenager, I couldn't exactly tell you what the reasons were why my mother left. Whatever it was did cause a big divide in our family, so I can only go by certain stories I think I know. I do however, know why I left, and so does my brother. My life was not easy, and the people who should have been my biggest protectors are the ones who ultimately caused me the most pain. This is my story. My story starts from the second my mom got sick with cervical cancer at twenty-eight and very soon after, passed away. I was just four years old. How can any young girl (or boy) at that age lose any parent, especially her mother, and not grow up to have some emotional issues? When she got sick my brother, and I went to live with my mom's parents, my aunt (mom's sister) and her daughter who is my cousin. While my mom was sick and in the hospital, the adoption process for my brother and me began. I was also very sick at that time having been born with serious kidney problems. I had to have surgery to correct those issues and my grandparents were the only ones who were able to provide that for me. Not to mention, they simply were the only ones who had the means to raise us anyway. My brother and I had different fathers and neither one of them were capable of doing that job. There was no way my mom would let us live with them anyway. They were not good men. She wanted to know that when she “left,” her babies would be safe and provided for. My biological dad was a hothead (to say the least). Combined with my health issues, I lived a very protected childhood. For both my brother and I, our fathers were not a part of our lives growing up. I had to stay home a lot, and I wasn't allowed to do much. I was only allowed to go to certain friends’ houses to play. I was the youngest of the three kids in my house growing up, but sometimes nothing made sense. I know they were older but they were always so much more free than me. We lived in a small neighborhood. All the kids were friends and played together no matter their ages. But there were times when I wasn't allowed to play, even if my sister and brother were there and it was with a whole flock of kids. I wasn't sick anymore and the surgery was a success. I was healthy. I didn't understand. I did learn later in life part of the reason was they were afraid my dad would try to kidnap me. Yet even as I grew older and some things changed, many things remained the same, and other things got even worse. My grandmother grew up in a different time during the 30s and 40s when women were taught to be a certain way, what she believed was “a proper lady”. If you weren't a proper lady you were frowned upon. Her and my grandfather in total had 4 children. My Aunt, who was their biological child, helped raise us. Another biological daughter was stillborn. I don't think my grandmother wanted to take a chance of going through that pain again so they adopted my mother and a son, my uncle. I believe that the loss of her second child, and possibly something that happened in her past caused her to treat her two adoptive children differently. The same pattern seemed to happen when my brother and I came along, but especially after she got sick with cancer. At that point, she was very cruel, and angry. In the same house that we shared with our cousin, the treatment we received was very different. It was very evident even to others who didn't live with us. We heard many stories over the years that it was the same way for my mom and my uncle. Nothing we did was good enough and we were always the source of my grandmother’s rage. Now I admit, I wasn't a perfect kid and definitely did things to be punished for, but the punishment often didn't fit the crime, if ever. They were usually designed to humiliate me more than teach me a lesson. Some of her disciplinary tactics would be cutting my hair to make me look like a boy, or making me wear long johns to school so the kids would laugh at me. Sometimes I was hit. Not beaten, but hit−enough to make me scared. When I got to the age where boys became an interest, I was told almost daily I was just like my mother and “she was a whore.” Who says that to their grandchild about their own child? Especially one who died at such a young age leaving me behind? It was often the smaller things she would get the angriest over, and if I tried to stick up for myself that made everything even worse. Over time, I just learned to shut up and take it. I stayed as quiet as I could to not draw attention to myself so I wouldn't get in trouble. My aunt and my sister were no better. They, too, said evil cruel things to me. My grandfather had no voice. It was clear who was the boss, and those women ran the house! Once when I was around 11 or 12 years old we had a snowstorm, so I went outside to shovel a pathway to our front door. When she saw what I had done, all my grandmother said was I hadn't even done a decent job, and why didn't I do things like that more often? I needed to help out more. Or, one time I was doing homework and she didn't like my penmanship. “It wasn't proper,” she said. So she grounded me for a month. “Maybe you will learn how to write properly in that time.” she said. If my chores weren't done to her satisfaction, not only was I made to redo them, I was told for the next week that I was lazy. If something was broken, or came up missing in our house, I was the one who was always blamed and punished for it whether I did it, or not. And let me just say, it was never me! She would literally make things up to yell at me about and be angry about. Her favorite thing to do would be to follow me around the house and then after I would leave a room put something on the floor like a brush, hair tie, or tissue (anything really). Something pretty noticeable you wouldn't miss. Then she would come get me and ask why I didn't pick it up and take care of it. Then all I heard was how I was a horrible little girl and worthless. I spent as much time at after school activities and at my friends’ houses on the weekends so I didn't have to be there. And this kind of thing went on even after I moved out at 16 until I was an adult, until she passed away. My school grades were always a problem too. I was not a good student I admit that. Don't get me wrong, I understand how important getting an education is, but I had a hard time learning. What's worse is I was afraid to speak up and ask for help. When I did try to verbalize that I didn't understand, I was told I was lazy and just didn't want to do the work. This type of punishment was even performed by some of my teachers. Once I get something I get it, however if I don't understand it even to this day, I will just ignore it because I am afraid to ask for help. Because of that I have held myself back in many areas of my life, and no matter how well I did in one subject it was always,“why didn't you do better in this?” I can't even begin to tell you how many times I was told “why aren't you like so-and-so?” I was always compared to other people and told I was not good enough. I needed to be better. No matter what I did I was never told “good job,” or“we're proud of you.” All the while I was trying, but too afraid to ask for help for fear of something negative happening in return. I literally lived in fear when I was young and in many ways I still do. I have tons of friends but I don't bond with people easily. I tend to not necessarily be shy, but definitely standoffish, and am always on the defensive with people. Even though I know that is not their intention I always feel like I am in trouble. Still to this day I am picky about who I let physically touch me. If I allow you to give me a hug, male or female, please know you are very special. As I said, like my mother and brother before me, we all left home at sixteen. When I left by this time I had met my dad and that is where I ended up going to live. At that point he had another wife and my two younger brothers. Things weren't better there, but they weren't worse. I was ignored there, and forgotten. Quite honestly, by that time, I actually preferred that to constant emotional and mental abuse. I didn't leave because I thought the grass would be greener or anything like that. It wasn't about following the rules, as my grandmother would have people believe. The life was being sucked out of me. I wanted to die and didn't have anyone to talk to. I was a teenager I didn't know what to do. They should have been teaching me how to be a strong young woman. They should have been teaching me about life. Unfortunately no one was guiding me.Instead they were oppressing me. As an adult, for all the anger and bitterness I could have and hold towards people, I have become the better person. I do sometimes find myself falling into the emotional traps of my past and holding back, but I am now making a much more conscious effort to step outside of my comfort zone. As much as my grandmother hurt me I have forgiven her because I don't know what made her so angry. I can't say that I have ever actively sought out any kind of professional help in my life. Or, that I ever found anything like yoga, meditation, or even religion to help me deal with the emotions I have had bottled up. Through most of this I have dealt with it all on my own, and there is a constant daily battle in my head. I have been very lucky to have an amazing circle of friends around me. Some are my childhood friends, and some I have met over the years through activism for women, and social media. When I was in school it was my sports and the refuge of my friends homes on the weekends that I really believe kept me alive back then. I married my husband when I was 24. We married 3 weeks to the day after we met, and here we are over 12 years later. I would be lying if I didn't say that if I had not met him and married him when I did my life would definitely be different right now. I don't know where I would be. He lets me cry when I need to cry, be grumpy when I need to be grumpy, be OCD when I need to be OCD and he helps me when I need help. He doesn't judge me he just loves me and lets me be me. Most importantly he has given me the stability that I need to feel safe. As much as my grandmother hurt me I have forgiven her because I don't know what made her so angry. Honestly after everything she did to try and break my spirit, I loved her. And if I hold on to that hurt I will become the same as her. I don't want to be that way. I have an amazing relationship with my aunt now. She has been my rock. With my brother, obviously it's more complicated. 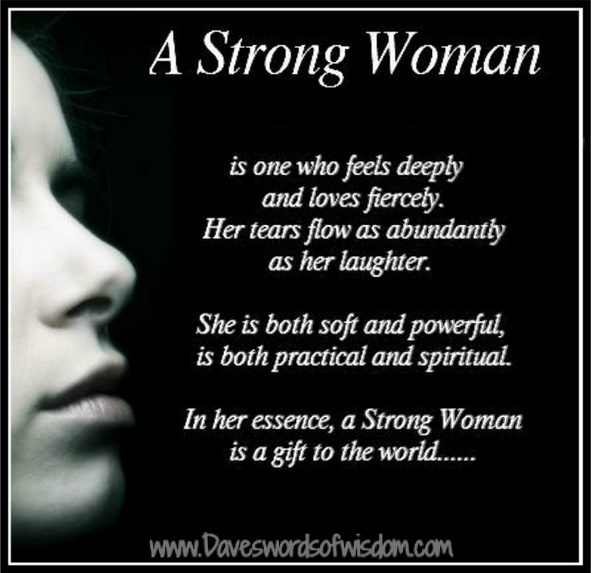 I am happily married to an amazing husband who treats me the way every woman should be treated. I do have moments of weakness, but who doesn't? And for as messed up as I could be I am not broken, I am very strong. I am a survivor! This story was submitted to We Are Woman anonymously by a Miss Revolutionary.